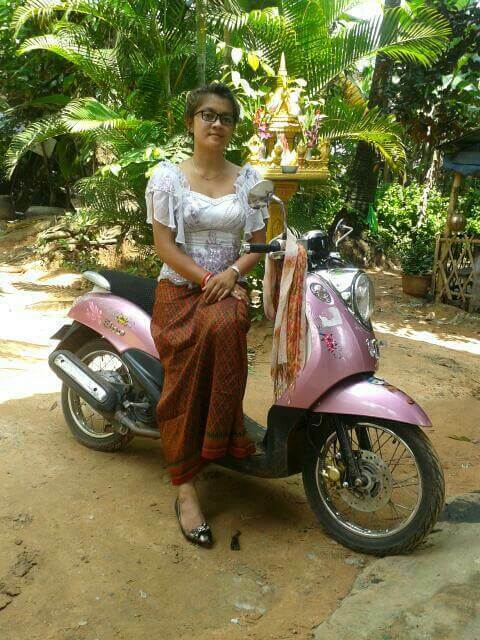 Actually, the Pchum Ben festival tooks place in Cambodia. Pchum Ben is one of the most important festivities in Cambodia and lasts a total of 15 days. Of these, three days are public holidays. During this time, half of Cambodia is on its feet to visit relatives from near and far and to visit the to commemorate the dead. That’s what the Pchum Ben Fest is all about. Lee Heng picked me up with his motorbike in the early morning from the guesthouse. From there we drove to his aunt. On the way there, I was struck by the festively dressed women. No matter if young or more mature at years they wore the traditional Khmer clothing, beautiful skirts from colored side and embroidered blouses. Sitting on the side of the motorcycle, they elegantly held a lunch bucket in their hands while they were driven by men dressed in festive clothes. Similar to the Cambodian school and university clothing, this consisted of dark cloth trousers and a white shirt. After about 20 minutes we arrived at Lee Heng’s aunt. She had already prepared everything and before I knew it, I held a lunch bucket in my left hand. I felt honoured and sat proudly on the back of Lee Heng’s little motorcycle. The journey went on to a very special pagoda and I was really looking forward to what would happen to me. Arriving at the pagoda, there was a lot of activity. All these gesticulating Cambodians were either trying to get into the pagoda or after the ceremony they wanted to get out again. Above the turbulent bustle, the dense haze of countless incense sticks hung in the already humid and hot air of the tropical climate. Lee Heng found a parking lot and we went on foot to the pagoda. At the entrance we had to deliver our flip flops. For a small fee of 500 riel (around 13 cents) we had a watchdog. Honestly, I couldn’t even imagine ever seeing my flip flops again. After all, hundreds of them stacked themselves crosswise on a pile. And one more or less uninhibitedly stomped across the heap of shoes to reach the inside of the pagoda as quickly as possible. Lee Heng had taken the lunch bucket from me in the meantime – the food was distributed on small plates. A sea of food – almost all the floor was covered with plates full of food. In one corner of the room, monks and musicians sat on the floor with their strange sounds to my ears. A short time later Lee Heng pressed a small tin can with a spoon into my hand, which was filled with rice. Now I was supposed to line up in a row right behind him and watch out that no Cambodian would jump between us. Which wasn’t easy at all. Now it was Lee Heng’s turn. In the front right of the photo. The ceremony consisted of hanging small Riel bills on a tree-like frame decorated with flowers, jewellery and candles and placing the rice spoon by spoon in pots lined up on a long table. Actually, it should go back on the other side, so that the board was circled once. But it was so crowded at the time that it was decided to open a completely new series. Although only half of the ceremony was completed, participation in the ceremony was still considered to be fulfilled. At the end of the table, an elderly Cambodian plucked the bowl from my hand and packed the rest of the rice onto a large pile of rice. I have to admit that I was surprised how these vast amounts of food were handled. But especially the monks are happy to be able to fill their bellies with joy on these days. Street children and poor families also benefit and enjoy themselves. After the rice ceremony we went to the next “department”. A shrine with a mountain of glowing incense sticks. Lee Heng gave me already glowing incense sticks to stick in the sand. I had to be very careful not to hurt anyone in front of, behind or next to me with the falling embers of my incense. Miraculously we both got out of the pagoda unharmed and without any burn injuries. And you can hardly believe it: Even the flip flops were quickly found again. Of course, with the ceremonies it has a deeper affinity in Buddhism and is not just simply distributing food in general on the ground and rice in particular in pots. 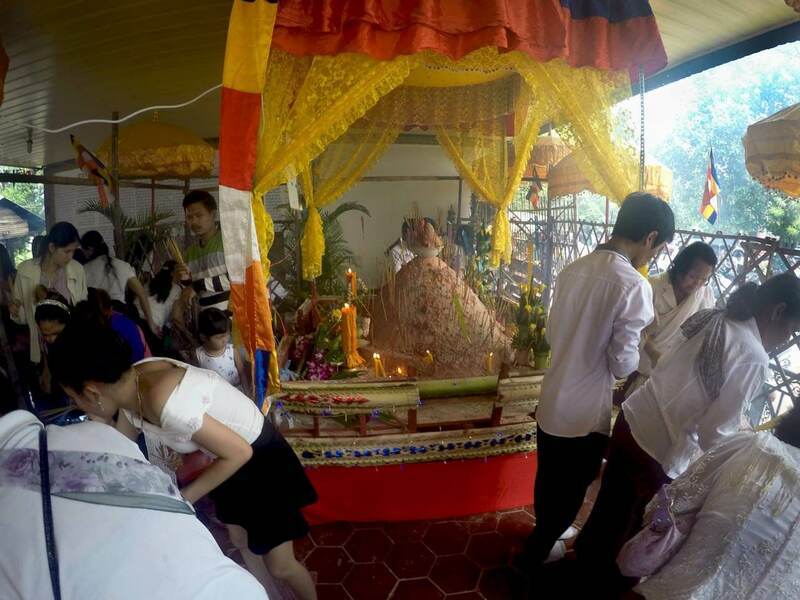 I’ll tell you what this is all about in the article Pchum Ben – Ancestor’s Day, History and Legend.